The Russian Debutante's Handbook introduces Vladimir Girshkin, one of the most original and unlikely heroes of recent times. The twenty-five-year-old unhappy lover to a fat dungeon mistress, affectionately nicknamed "Little Failure" by his high-achieving mother, Vladimir toils his days away as a lowly clerk at the bureaucratic Emma Lazarus Immigrant Absorption Society. When a wealthy but psychotic old Russian war hero appears, Vladimir embarks on an adventure of unrelenting lunacy that takes us from New York's Lower East Side to the hip frontier wilderness of Prava--the Eastern European Paris of the nineties. With the help of a murderous but fun-loving Russian mafioso, Vladimir infiltrates the Prava expat community and launches a scheme as ridiculous as it is brilliant. 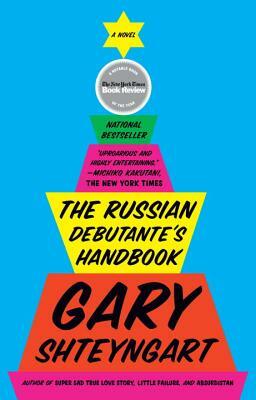 Bursting with wit, humor, and rare insight, The Russian Debutante's Handbook is both a highly imaginative romp and a serious exploration of what it means to be an immigrant in America.